Bestselling author and one of the world’s foremost executive coaches, Marshall Goldsmith examines the emotional and psychological triggers that cause us to react and behave in certain preset, often inappropriate ways at work and in life. Triggers shows us how to break that cycle and enact meaningful change. In Triggers, renown executive coach and psychologist Marshall Goldsmith discusses the emotional triggers that set off a reaction or a behavior in us that often works to our detriment. Do you find that at times you suddenly become defensive or enraged by an idle comment from a colleague? Or that your temper rises when another car cuts you off in traffic? Your reactions don’t occur in a vacuum. They are the result of emotional and psychological triggers that often happen only in specific settings—at meetings, or in competitive situations, or with a specific person who rubs you the wrong way, or when you feel under particular pressure. Being able to recognize those triggers and understand how the environment affects our behavior is key to controlling our responses and managing others at work and in life. Make no mistake—change is hard. And the starting point is the willingness to accept help, and the desire to change. This book will show you how. Over the course of this book, Marshall explores the power of active questions to get us to take responsibility for our actions—and our failure to act. Questions such as “Did I do my best to make progress toward my goal?” “Did I work hard at being fully engaged?” He discusses the importance of structure in effecting permanent change. Because, he points out, change is hard, and without a structure to keep us on track, we inevitably relapse and fall back. Filled with illuminating stories from Marshall’s work with some of the most accomplished executives and leaders in America, Triggers shows readers how to achieve meaningful and sustained change that will allow us to open our imaginations and escape the rigidity of binary thinking. To ask other readers questions about Triggers, please sign up. please if someone could send me a copy of the book? Kathryn Hall This book is now available for sale on Amazon. Oddly, the "did I do my best" part doesn't take us off the hook. It keeps us honest. If I ask "Did I make progress toward my goals today? ", I could say "No, too many other things interrupted me, I didn't have the time." But if I ask "Did I do my best," it forces me to examine what I could have done within those conditions to make progress toward my goals. And it pushes me toward thinking about how I can change the conditions that bar me from making progress. The book is aimed at a privileged audience (corporate executives) whose major obstacles lie within their own personalities and habits. It is going to be less useful for the majority of us who face objective obstacles. And it never addresses the question of competing goals: for instance, what if spending time with my wife "building positive relationships" conflicts with my goal of getting new consulting clients? When it comes down to it, everybody is going to have to choose sometimes...and those choices shape the person you become, whether or not it's "the person you want to be." Nothing substantive here beyond basic will power. Some people just don't have it.. and need coached? Seems like it's really bent towards naive, well-to-do, spoiled-rotten exec types. Not geared towards anyone who has ever had to make an ounce of budget decisions in regards to food or housing. While there are no innovative thoughts, it does contain a wealth of practical, actionable steps that people can use to change and grow. I will be adapting some of his logic with my clients because they are down to earth and focused. Developing into leaders that help shape the 21st century is no easy task and we can use all the help that people can provide. This book provides some excellent tidbits. The best takeaway for me was: "When we dive all the way into adult behavioral change-with 100% foc While there are no innovative thoughts, it does contain a wealth of practical, actionable steps that people can use to change and grow. I will be adapting some of his logic with my clients because they are down to earth and focused. Developing into leaders that help shape the 21st century is no easy task and we can use all the help that people can provide. This book provides some excellent tidbits. The best takeaway for me was: "When we dive all the way into adult behavioral change-with 100% focus and energy = we become an irresistible force rather then the proverbial immovable object. We begin to change our environment rather than be changed by it. The people around us sense this. We have become the trigger." I finished this book faster than any other I've started reading recently. The writing is straight forward and easy to read. The topic may be a "doh" to some but to those of us used to living in our heads, either intellectually or emotionally, or both, there is a certain "aha" sensation that can be derived from the author's teachings. I found his perspective and manner of putting things to be quite helpful me as I navigate my life. Yes, this book has "executives" as its focus. Marshall Goldsmith, a management consultant, explains how to develop and maintain good habits -- and it's all about certain kinds of mindfulness and structure. I'm a Marshall Goldmsith fan. I loved his book "What Got You Here, Won't Get You There" and have recommended it to many people. This book is useful only if you are focused on wanting to get more out of your life. It's one of those instances where the student needs to be ready in order for the teacher to appear. Those who read it with no intention of actually changing anything about how they think or structure their days will quite likely miss the point of this book. While Goldsmith is indeed a v I'm a Marshall Goldmsith fan. I loved his book "What Got You Here, Won't Get You There" and have recommended it to many people. This book is useful only if you are focused on wanting to get more out of your life. It's one of those instances where the student needs to be ready in order for the teacher to appear. Those who read it with no intention of actually changing anything about how they think or structure their days will quite likely miss the point of this book. While Goldsmith is indeed a very successful "Executive Coach" we are all the executives of our own lives. So move past the title to the material. It's not that this work is groundbreaking or provides some secret formula, it's designed to help us organize, prioritize and identify what matters to us. His questions focus on what gives our life meaning and value and how we can structure our days to support those things we have identified as priorities. It's simple, but not easy. True of so many things in life. I found it helpful. I'm at a "sorting out" place in my life where I want more structure, more meaning and a better defined purpose. There are lots of moving parts to actually figuring that out. Notice it's about measuring effort over outcome. It makes sense that consistent effort produces the outcomes we want. We don't just leapfrog over the process to meeting our goals and arrive at success. Change is hard. Change is even harder when you are trying to modify your behavior. Habits have become a popular subject in books; it seems as though we are always trying to find the easy way to change them, whether it is quitting smoking, starting a new exercise program, or becoming a more active, positive contributor during our work meetings. 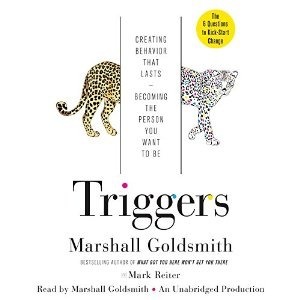 Marshall Goldsmith's latest book, Triggers: Creating Behavior That Lasts - Becoming the Person You Want to Be, tackles this subject head-on in an insightful, practical way. Goldsmith is a bestselling business author and leading executive coach to American CEOs, so he brings a wealth of stories and examples as well as years of experience to the book. Triggers focuses in on exactly what the title says: the triggers in your life that lead you to behave the way you do. As he points out, we so often dismiss the major role that our environment plays, and, unfortunately, there are many things about our environment that we cannot change or control. However, we can learn to manage how we react. Goldsmith presents both the how and why to identify and move beyond our triggers. As you would expect, the beginning of the book is about the triggers - what they are, how to identify them, the different types, and how they work. He discusses the barriers to change: the things that make it hard to change our behavior, despite our best intentions. He then presents the Wheel of Change, an easy-to-understand graphic that can be utilized to help us identify how we can go about changing. The second part of the book is all about trying to make the change. As he points out, the most important thing about making a change is trying. Unfortunately, for the vast majority of us, the idea of trying has become associated with failing as we've aged, rather than associated with success, as it was when we were children. But real change takes time; there is no silver bullet to get through the process overnight. One of the key components to trying is accountability, which Goldsmith addresses through daily, engaging active questions. These questions put the onus on you, rather than providing a way to answer in a way that blames other people or your environment. The other important aspect of this is the requirement that someone else ask you the questions. This person can merely record the scores and not say anything, or they can be fully engaged with you along the way (or somewhere in the middle). The third part of the book is about the importance of structure in any attempt to change. The daily questions are a core structural element that the book advocates. Structure also helps us with some of the roadblocks we face. For example, we all face the Influence of Depletion. As the day goes on, our energy begins to wane, but we are usually unaware of its influence. Recognizing its influence can help us put more structures in place to combat it. An interesting book from one of the best coach of the world of Marshal Goldsmith. The book is full of stories and examples, read simply and easy. Especially remembered the method of "motivational questions" and improvement through "structure". In a word, the book will be worthy of the place of the best readers of 2018 year-olds. Цікава книга від одного з найкращих коучів світу Маршала Голдсміта. Книга сповнена історіями та прикладами, читається просто та легко. Особливо запам'ятала An interesting book from one of the best coach of the world of Marshal Goldsmith. The book is full of stories and examples, read simply and easy. Especially remembered the method of "motivational questions" and improvement through "structure". In a word, the book will be worthy of the place of the best readers of 2018 year-olds. Цікава книга від одного з найкращих коучів світу Маршала Голдсміта. Книга сповнена історіями та прикладами, читається просто та легко. Особливо запам'яталась методика "мотиваційних запитань " та вдосконалення через "структуру". Одним словом книга достойно займе місце кращих прочитаних бесцелерів 2018 року. The first 3 chapters of this book were very strong and easy to follow and completely applicable to anyone with behavior, and I had really excited positive feelings thinking that eventhough this is written with those in business in mind I'm so excited that it could bring understanding to even a full time mom like me (as I was recommended it by another mom). Plus, it is a goal of mine to read more non-fiction this year. But this wasn't to be. By chapter 6 or 7 this book took a very sharp and comple The first 3 chapters of this book were very strong and easy to follow and completely applicable to anyone with behavior, and I had really excited positive feelings thinking that eventhough this is written with those in business in mind I'm so excited that it could bring understanding to even a full time mom like me (as I was recommended it by another mom). Plus, it is a goal of mine to read more non-fiction this year. There is a group at my office who reads and discusses business books a couple times a year. This was our latest book, and I just finished. The "Reader Leaders" group usually has bigger turnout for our Ted Talk meetings or shorter articles than for full books, so it will be interesting to see how many of my coworkers make it through this one. It was ok. I liked the information presented, even though it wasn't anything groundbreaking. I liked the 6 questions and the intentional phrasing of "have I There is a group at my office who reads and discusses business books a couple times a year. This was our latest book, and I just finished. The "Reader Leaders" group usually has bigger turnout for our Ted Talk meetings or shorter articles than for full books, so it will be interesting to see how many of my coworkers make it through this one. It was ok. I liked the information presented, even though it wasn't anything groundbreaking. I liked the 6 questions and the intentional phrasing of "have I done my best today to . . . " which puts the emphasis on yourself and your efforts and your actions, rather than external forces or results of your actions. It's a good thought. I have post it notes on a couple of pages, including the whole concept of "Am I Willing At This Time" or AIWATT. The parable of the empty boat reminds me of the parable of the cow in the parking lot, which was the subject of a self-help book that I actually enjoyed a lot more, which gave a nice introduction to Zen Buddhism and was called The Cow In The Parking Lot. What's not as great in Triggers is the smug attitude of the author which seeps through and annoys in a distracting manner. He's very successful. He sells books and gives speeches for a living. But he knows absolutely nothing about most of his readers, me included, as most of us will never be engaging him for personal coaching services, but he certainly acts like he knows everything about everyone. I've read plenty of books about people who are the absolutely best at everything. Right now I'm still reading The Wise Man's Fear: Kingkiller Chronicles Day 2 by Patrick Rothfuss. That book is over a thousand pages long and has a fabulously interesting fantasy universe plot. It's taking me forever to read though as the protagonist is annoyingly described as "the most interesting man in the world" but I think Marshall Goldsmith is giving Kvoth a run for it. 1. He finds overweight people completely weak and unacceptable, while admitting that he's never carried extra weight. There are so many examples of this smug attitude and lack of compassion or understanding for his clients or overweight people in general, but the most glaring example is in the footnote on page 214 when complaining about compliance issues, settling for "good enough" and wondering: "why doctors let patients get away with this misbehavior [of not losing weight]". Since when are doctors deputized by some looming overlord to prevent people from "getting away" with eating? Using his own book's concept, people may decide they are not AWIATT to change their life just to lose weight as they might have something even more important than this. Apparently that is not an acceptable choice, as no fatties allowed in the Goldsmith realm. 2. Unnecessary judgment sails through almost every chapter in this book. Among the things not worthy of human pursuit for Goldsmith includes one of my hobbies, which is writing book reviews. I'm not too concerned that Goldsmith is going to read this review because he went on a quite a long rant about what a waste a time a client of his engaged in while writing a negative review of a book. The only valid point in Goldsmith's diatribe against his client's negative review of a book was that by spending so much time writing a review of something that annoyed his client, the author of the book actually took up more real estate in that client's mind, which impacted the client much more than the author. This is counterproductive for the client as he could have just moved on. While I agree that holding on to anger or seeking revenge is ultimately more damaging for the aggrieved than the perceived source, Goldsmith's broad condemnation of the entire field of literary (or film, or product, or any type of) criticism and commentary is just ignorant. He doesn't acknowledge any merit to the whole field, which I think can be both art and helpful basis of data for potential customers. I write a lot of book reviews. Most of mine are actually positive. I'm not going to spend more than an hour writing this review, which is significantly less time than it took me to read the book. It gives me closure, and I like having an audience. Maybe it wouldn't have any value to you and who you are, Goldsmith, but I'm not you. 3. And finally, on the same theme, he gives such pithy advise along the line of (this is not an exact quote, but the outfit is spot on) "if you wear anything other than khakis and a green polo shirt every day, you're wasting time and money on clothes." Seriously dude, if I ever left the house in khakis and a green polo shirt, I'd consider the day a complete failure and go back to bed. You don't know me. I don't want to be you. Maybe you should try a 6 question every day approach to trying to see if you've done your best to try to consider being someone besides yourself before giving blanket advice to the public. Have I read my book and thought "how would someone not me perceive this screed against x which really is a choice and not that important"? I liked the change approach, the questions, the reminder of the empty boat, and the internal locus of control focus on this approach. I just didn't like Goldsmith. Sorry dude. Поки читала згадувала, як колись в університетські роки мала досвід перекладу книжки чи з десяток її розділів з англійської на українську. Чому згадала? Бо робилося це, як завжди у студентів, за одну ніч. От подекуди сидиш, позіхаєш, підбираєш найбільш схожий на правду відповідник терміну чи звороту і час від часу розумієш, що картинка не складається, що сенс речення чи навіть абзацу просто вислизає від тебе. Так от зараз мені здалося, що з перекладачкою цієї книжки теж таке було. Принаймні на початку книжки. Особливою ностальгією в моїй душі відзначилися переклади назв дій, психологічних кроків, що створювали певну структуру, бо дуже вже ясно я собі згадувала цей процес підбору з-поміж кількох чи кільканадцяти (хто вчив англійську, знає) варіантів одного найбільш влучного. Але після вибору все одно звучить кривувато, ще й запам’ятати важко. Але то просто затягнувся ліричний відступ. 1. Good things happen when we ask ourselves what we need to create, preserve, eliminate, and accept – a test I suspect few of us ever self-administer. *Discovering what really matters is a gift, not a burden*. Accept it and see. 2. 1-to-1 Meeting Questions: Where are we going? Where are you going? What is going well? Where can we improve? How can I help you? How can you help me? 3. When we have structure, we don’t have to make as many choices; we just follow the plan. And the net result is we’re not being depleted as quickly. 4. AIWATT: Am I willing at this time to make the investment required to make a positive difference on this topic? 5. WHEEL of CHANGE: Creating. Preserving. Eliminating. Accepting. 6. At the highest level, a coach is a source of mediation, bridging the gap between the visionary Planner and the short-sighted Doer in us. 7. Forecasting the Environment: Anticipation. Avoid. Adjustments. 8. Daily Questions – reinforce our commitment. They ignite our motivation where we need it, not where we don’t. They highlight the difference between self-discipline and self-control. They shrink our goals into manageable increments. 9. The best we can hope for is consistency in our effort – a persistence of striving – that makes other people more charitable about our shortcomings. Good message, actionable practice, but the endless humility became annoying. Ще один камінець у підмурівки зміни. Зауважила за собою - кількість книг, що спонукають мене до просвітлення, цитати з яких хочеться написати собі на чолі маркером - геть не відповідають кількості впроваджених змін ( сарказм). Ця - практична у всіх сенсах, мені подобається мислення автора не тільки тим, що воно відрізняється від співчуття мого психотерапевта. Читаючи її в час радості і в час безнадії, я бачу, як усе це працює чи не працює. Я злюся або надихаються, але я завжди схильна перечитати Ще один камінець у підмурівки зміни. Зауважила за собою - кількість книг, що спонукають мене до просвітлення, цитати з яких хочеться написати собі на чолі маркером - геть не відповідають кількості впроваджених змін ( сарказм). Ця - практична у всіх сенсах, мені подобається мислення автора не тільки тим, що воно відрізняється від співчуття мого психотерапевта. Читаючи її в час радості і в час безнадії, я бачу, як усе це працює чи не працює. Я злюся або надихаються, але я завжди схильна перечитати ще раз і врешті решт погодитися спробувати. This is an amazing book about Adult behavior change. It addresses goal pursuit and more importantly interpersonal relationship improvement. There are simple and strongly effective tools laid out to try it for yourself. I went back and reread many sections to better understand them and implement them for myself. I suspect that I will be returning to this book and recommending it to others for some time to come. TRIGGERS is one of the most important books of 2015 for both business and personal betterment, namely in enacting adult behavioral change. As author Marshall Goldsmith writes, “Fate is the hand of cards we’ve been dealt. Choice is how we play the hand.” This book helps us to overcome many of the obstacles we may already know about and then lets us triumph with lasting change by making effective choices. “I’d go so far as to say that adult behavioral change is the most difficult thing for sentient TRIGGERS is one of the most important books of 2015 for both business and personal betterment, namely in enacting adult behavioral change. As author Marshall Goldsmith writes, “Fate is the hand of cards we’ve been dealt. Choice is how we play the hand.” This book helps us to overcome many of the obstacles we may already know about and then lets us triumph with lasting change by making effective choices. “I’d go so far as to say that adult behavioral change is the most difficult thing for sentient human beings to accomplish.” Many readers may look at books like this as common sense, but there’s “plenty here that you don’t already do”. Goldsmith has a chapter on the everyday excuses we give ourselves, whether we mean to or not. More importantly, he helps us realize that “Our environment is a magnificent willpower-reduction machine.” “We think we are in sync with our environment, but actually it’s at war with us.” Goldsmith elaborates into tools within the environment that can help us “trigger” the positive change we are looking to achieve. There aren’t many graphs or bullets, like many of the business books of this type, but instead are personal stories of how Goldsmith has come to an understanding of change and how it has helped many of his high-profile clients. There are certainly Covey-like graphs with four quadrants, as well as acronym takeaways. However, the biggest help (to me, at least) are the key questions, both daily and hourly. 1. Did I do my best to set clear goals? 2. Did I do my best to make progress toward my goals? 3. Did I do my best to find meaning? 4. Did I do my best to be happy? 5. Did I do my best to build positive relationships? 6. Did I do my best to be fully engaged? The questions don’t stop here: they pertain to anything from helping your spouse to losing weight to being on time to events. There’s plenty for us to seek out and improve. The key is: “Structure not only increases our chance of success, it makes us more efficient at it.” Through the tools that Goldsmith offers, we are given the energy and power to combat resource depletion and procrastination. Through questioning and structure and by choosing what to create, preserve, eliminate, or accept, we can change for the permanent good. Always getting better, with sustainable improvement. Thank you to Blogging for Books for sending this book for my review. It’s a life changer. Did you do your best to be happy? Did you do your best to find meaning? Did you do your best to build positive relationships with people? Did you do your best to be fully engaged? Also, to remember: All those petty annoyances - the rude customer, the stonewalling service rep on the phone, the driver that cuts you off on the highway - none of them are even thinking about you. They're unaware of you, don't care about you, and didn't set out that day to bug you. Getting upset with them doesn't help you. Find a way to calm down and move on. "Our mission in life should be to make a positive difference, not to prove how smart or right we are." "Every decision in the world is made by the person who has the power to make the decision. Make peace with that." The other really helpful suggestion Goldsmith has is to tell someone what you are working on and to schedule a daily, brief conversation with that person so that they can ask you the questions that pertain to the improvement you're working towards. A daily check in to help keep this in your consciousness and in your effort. You'd be surprised how far that gets you. I try this every day. Sometimes I succeed, more times I fail. But I'll definitely be adding working on positive relationships and not fighting unnecessary battles (and not needing to prove how smart or right I am in every setting). Nudges. Being aware of the affordances of our environment. The Fundamental Attribution Error. Ego depletion...parts of this book read like a slightly outdated rehashing of Psychology 101. But parts of it were really intriguing to me, if only because he and I have mulled over a lot of the same questions--how do you get adults to change their behavior?--and independently built a lot of the same models. Though his were based on work coaching executives and mine based on interviews with people tryin Nudges. Being aware of the affordances of our environment. The Fundamental Attribution Error. Ego depletion...parts of this book read like a slightly outdated rehashing of Psychology 101. But parts of it were really intriguing to me, if only because he and I have mulled over a lot of the same questions--how do you get adults to change their behavior?--and independently built a lot of the same models. Though his were based on work coaching executives and mine based on interviews with people trying to lose weight, improve their finances or or read more, the basics of behavior change remain. I can see how many people would have a "duh" reaction to the first ~30% of this book. Most great models are super intuitive and _should_ illicit a "duh" reaction. But actually acting on those models, changing your behavior based on your awareness of these models, is the hard part. I particularly liked his focus on building time for "awareness" after you're triggered by something in your environment but before you act. I wish there were some magical practice--or even app :) --that could help you develop this awareness. It's something I personally struggle with: how do I turn off auto pilot? Not sure I buy the AIWATT (asking yourself, "Am I ready, at this time to make the investment required to make a positive difference on this topic?"). Sure, seems like a good question. But the hard part, for me at least, is in remembering to ask it. I wish he had focused on that more. I really liked the concept of "magic moves"--things that you can do that immediately help ease a relationship: apologize, ask for help, express optimism. Optimism as a magic move was particularly appealing to me. I realized that almost everyone I've loved working for or with had this quality: they expressed excitement and confidence about a vision, and helped me believe in it, too. Borrowed from library - I'm on a productiveness self-help kick this year. This book is mostly about how easy it is to slide back to old behaviors despite your best intentions to do better in some aspect of your life. It's easy to rationalize and make excuses, so the basic idea is to really track your effort and through that keep yourself more accountable: are you REALLY trying? And what external factor may be affecting us? I give this book high points for pointing out something obvious yet someth Borrowed from library - I'm on a productiveness self-help kick this year. This book is mostly about how easy it is to slide back to old behaviors despite your best intentions to do better in some aspect of your life. It's easy to rationalize and make excuses, so the basic idea is to really track your effort and through that keep yourself more accountable: are you REALLY trying? And what external factor may be affecting us? kind of books that you feel sad when you about to finish it. reading The Power of Habit and Thinking Fast and Slow helps you build a deeper understanding. though the idea of the book is simple but how to apply it in your daily life (work or personal) needs work. people dont change untill they believe they want to change. couldn't help my brain wondering a lot about how to apply the concepts and how to evolve the ideas to match my day to day. week to week and year to year. how to help people around kind of books that you feel sad when you about to finish it. people dont change untill they believe they want to change. couldn't help my brain wondering a lot about how to apply the concepts and how to evolve the ideas to match my day to day. week to week and year to year. how to help people around me to understand the concept without reading the book.... endless list. Книга написана по схеме "проблема-решение", причем в качестве проблемы обозначен вопрос: "Почему взрослому человеку так сложно изменить свое поведение?". Авторы изучают внутренние (установки) и внешние (триггеры) барьеры, которые блокируют наши изменения. После чего предлагают технику ежедневных активных вопросов, которая помогает сдвинуть наше саморазвитие с мертвой точки. Техника не новая и вполне эффективная, но это лишь одна из техник :). В целом книга - неплохой вариант применения идей и те Книга написана по схеме "проблема-решение", причем в качестве проблемы обозначен вопрос: "Почему взрослому человеку так сложно изменить свое поведение?". Авторы изучают внутренние (установки) и внешние (триггеры) барьеры, которые блокируют наши изменения. I found myself disagreeing with some of the content of this book; enough that I really didn't care for the book. Some of the content I find contrary to other researchers in the realm of positive psychology, behavioral change, and wholehearted living. I also found the book overly focused on the author himself. Good advice from an executive coach for creating habits and behaviour that lasts. I like Goldsmiths anecdotal style, but I can see that it might not be something for everyone. Sometimes the book was a bit repetitive, but not so much that it annoyed me. Asking yourself a set of questions every day is supposed to trigger new habits. As he says, the odds of his clients making change is high because he is "with them every step of the way". They are not just reading this book and making change based on the advice in it.